New Rec Ball Season Means “Full Court Press” is Back! 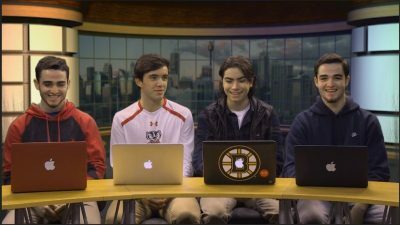 The WHS Lobby-O journalism production team was in studio at Westborough TV this week anchoring the season premiere of their top-rated sports show: “Full Court Press.” The crew will be covering the 2018-2019 RecBall season. Westborough’s Rec Dept Basketball season begins on Dec 16, 2018 and in this first show the crew breaks down the draft and how the season is looking for various teams. The Full Court Press production team includes Kathy Stoker’s WHS Journalism students: Alex Badger, Domenic Casparriello, Matt Doherty, Mike Doherty, Quinn Donovan, Eric Gould, Matt McCarthy, Jack McGinn, Ryan Nichols, and Will Schiffman.